MIAMI -- LeBron James and Dwyane Wade fancy themselves as two of the best finishers in the game, each with a track record of being able to create and convert plays in pressure situations. The Atlanta Hawks have no such reputation, save for a couple Joe Johnson moments over the years, and that is unfair at this point. Because this season the Hawks have proven to be one of the best finishing teams in the NBA, especially in crunch-time situations on the road. 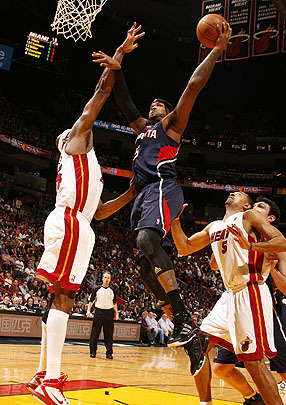 The quietly surging Hawks made a statement with their 93-89 overtime victory over the Miami Heat on Tuesday night. And it wasn't just that Miami, now on a four-game losing streak, still hasn't arrived even after its white-hot 21-1 stretch is now a distant memory. Atlanta fought at the end of regulation and overtime, when James, just back from a sprained ankle, twice missed potential game-winning 3-pointers. The Hawks moved to 12-0 on the road this season when leading after three quarters and 23-1 overall. They did it this time without Al Horford, who missed the fourth quarter and overtime with a sprained ankle. That makes 14 road wins so far for the Hawks, second in the East only to the Heat. Atlanta has won five in a row on the road, including victories in Miami and Utah. "We showed up tonight," said a drained but satisfied Hawks coach Larry Drew, whose team improved to 28-15 with wins now in seven of its past eight games. "We just hung in there." The Hawks absorbed 34 points from James, who came back after missing two games with a sprained ankle, and 27 from Wade. They played lineups in which the tallest player on the floor was 6-foot-9 Josh Smith. With a little help from the Heat, the Hawks were also able to neutralize both James and Wade when the game was in the balance. Whether it was the Hawks' tenacity -- they came back from six points down and then five points down in the fourth quarter when the Heat looked poised to run away -- or their own uncertainty, the Heat were clearly out-of-whack. Playing without Chris Bosh because of his own ankle sprain and not really sure James would be able to play until an hour before tip, the Heat looked as disjointed as their rough days back in November. This was illustrated best by James, who was both at the top of his game and at his worst at various points. It was almost a throwback to his middling days in Cleveland, where he'd completely take over a game, forget about his teammates and appear to both win it and lose it by himself a half dozen times before the final buzzer. "I had a week off and that is what happens sometimes," said James, who had 10 rebounds and seven assists. "We had everything going and when you have a few injuries it takes the chemistry out, it takes the rhythm out of a team." The Heat's nice rhythm before the losing streak featured James and Wade sharing the offensive load. In moments when the Heat needed a basket, they proved difficult to keep track of, a dynamic that affirmed their decision to join forces in Miami. They even split the Player of the Month Award in December as the Heat looked unbeatable for five weeks. On Tuesday, Wade didn't take a single shot in overtime and James took six. It was eerily familiar to an overtime game back in November when Wade took seven shots in a home overtime loss to the Utah Jazz and James took only one. That was also the last time the Heat looked so unsure of themselves and their roles. They have certainly proven they can be effective playing together but they have yet to refine those habits. James fired up 30 shots, making just 11, and Wade didn't have a single attempt during the last seven minutes. Some of those struggles can be attributed to the lineups that were on the floor. Without Bosh and Udonis Haslem, long out with a foot injury, the Heat were scrambling to find big men to play together. For much of the game James played power forward -- and even played some stretches at center. But without good pick-and-roll partners late, James often just froze up and didn't run anything. The offense was frequently reduced to James just dribbling and waiting for something to happen with Wade nowhere to be found -- basically a repeat of his worst moments as a Cav when he didn't have a player like Wade on the floor with him. "So far this season when we have tweaked things and gone a bit unconventional, it has thrown us," Heat coach Erik Spoelstra said. "Unfortunately, we have to go through some pain right now." The fluid lineups of the last week have contributed to that pain, but the Hawks warrant some credit. The Heat's decision to go small played into Atlanta's hands as Drew deployed a small and athletic lineup that could easily match up. Some of the time, there were few, if any, good looks for the Heat because Atlanta played expert defense and didn't allow it. Johnson had an off night, shooting just 8-of-24, and Smith was just 6-of-18. But Jamal Crawford, who can play anywhere when his rainbow jumper is falling, had 19 points and Maurice Evans hit two clutch shots in overtime. And the Hawks just did what they do -- close out a game. "They fought us well," Wade said. "It was a good Eastern Conference game, a good battle. They made the plays down the stretch." CHICAGO -- If you ever wanted to see what a difference the fourth game in five nights makes on NBA teams, you should have tuned into Tuesday night's Bobcats-Bulls slugfest. D-Rose had no help: Derrick Rose had 33 points, but he took 28 shots. Ronnie Brewer had a nice night with 12 points and five rebounds, but after that, the Bulls didn't have much of an answer offensively. Luol Deng had just 10, going 2-for-11 from the field. Kyle Korver had just six, going 2-for-6 from the field. In order for the Bulls to win games without Carlos Boozer and Joakim Noah on the floor, somebody else has to step up and help Rose offensively. That didn't happen Tuesday night. "Derrick has been leading us this whole season, but we got other guys on this team who can step up and we got to make plays," Brewer said. "We got to make defensive stops and make plays on the offensive end. Tonight, Charlotte made more plays than we did." As Rose noted, it wasn't just regular plays, it was "hustle plays." The Bobcats seemed to get an extra rebound on several key sequences and took better care of the ball all night, turning it over just seven times, compared to the Bulls' 13. "It was a tough one," Bulls forward Taj Gibson said. "Going back and visualizing the game you look at the letdowns we had. We turned the ball over many different times. We gave them a lot of second-chance shots late. It's just frustrating looking back on it." Zach Harper, TrueHoop Network bloggers and fans gave their in-game opinions throughout Tuesday's slate of NBA action in Daily Dime Live. Myth 1: The New York Knicks are willing to do whatever it takes to get Carmelo Anthony, and they have the ability to match the New Jersey Nets' offer. This is really a pair of myths in one. It's far from clear that the Knicks are ready to gut the roster to get Carmelo Anthony. They want him, but the team is playing well and GM Donnie Walsh is loath to overpay. Furthermore, now that Amare Stoudemire is playing like an MVP candidate, the Knicks aren't as desperate to land a superstar as the Nets are, especially when there's a chance they could land Anthony in free agency this summer (see Myth 2). But even if the Knicks did want to attempt to match the Nets' offer, the deck is stacked against them. Not only are the Nets offering Derrick Favors (the one guy being discussed who has the potential to be as good as Anthony down the road), they are also offering a great trade chip (Devin Harris), multiple late lottery to mid-first-round picks (likely their own this year and a top-eight-protected pick from the Warriors in 2012) and -- this is a key point -- massive cap relief this season and beyond. Derrick Rose, Bulls: With Carlos Boozer sidelined again with an ankle injury, Rose took more shots (28) than the rest of the Bulls' starting lineup but made half to tally a game-high 33 points in Chicago's loss to the Bobcats. Offensive basketball: Each game in Tuesday's double dose of NBA action went down to the wire ... but the fans who didn't check out earlier had to avert their eyes at times to make it the distance. All four teams shot 40 percent or less, and Tuesday's two losers (Bulls, Heat) combined for 29 turnovers. "I stopped following it. It's getting to the point where you're just like, move on already or don't. I'm sure Melo is more tired of it than anybody. But it's just to the point, as a sports fan, you're just, 'All right, it's just enough.'" -- Dwyane Wade, six months removed from the Heatles' decision-making dramatics, on Denver's ongoing Melo drama. Without Chris Bosh in the lineup on Tuesday, LeBron James attempted a season-high 10 3-point field goals, connecting on just two. For the season, when Bosh is not on the court, James takes almost twice as many 3s per 48 minutes as when Bosh is on the floor, and he misses a significantly higher percentage. The Heat's half-court offense was not in sync on Tuesday with Chris Bosh out and LeBron James making his return from injury, as Miami missed more half-court shots and turned it over more frequently than their season average. Overall on the season, the Heat shoot 48.3 percent from the field with Bosh on the floor and 43.6 percent with him off it. Josh Smith dropped the hammer on Erick Dampier and the Heat, scoring 15 points and pulling down 12 boards in Atlanta's 93-89 overtime victory. The students in John Williams' classes at Cheshire High School in Connecticut will arrive Wednesday to find a new number on the whiteboard. When they left Friday, the number had been 35. After four days off (three for the holiday weekend and another for a snow day), they will return to see the number now at 28. Williams doesn't teach math. He teaches what is now called technology but back in the day was known as industrial arts. He also happens to be the father-in-law of Ray Allen of the Boston Celtics. And the number he writes on his whiteboard is the number of 3-pointers his son-in-law needs to overtake Reggie Miller as the NBA's career leader in 3-point conversions. Miller's record stands at 2,560. "I noticed at the end of last year how close Ray was, and when I went to their exhibition game in Hartford, I turned to my wife and said, 'He's going to break the record. This [school] year. Do the math,'" Williams said in a telephone interview.